For my current project I'm playing around with the basic code needed to make an adventure game. A game genre that's fallen by the way side a little. In the most recent commit (code available here using the simple Engine code explained in my book) I've added loading and saving of the navmesh and layers. Layers are, for now at least, just going to be sprites a little like Photoshop's layers. 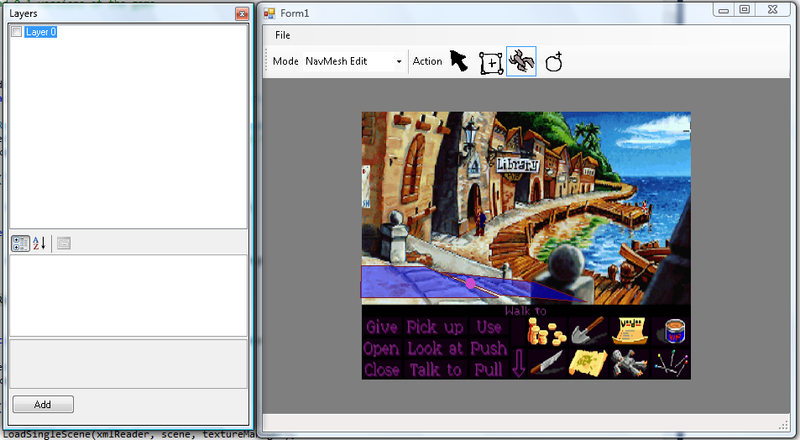 The screenshot at the top is from Monkey Island and it's loaded in as layer zero. The there are two walkable areas that share a connection. In this particular screenshot the character sprite should shrink as he walks down the peer this would easy to add by giving each vertex a scale and then using those weightings to determine the current size of the character. Or it could be fixed absolutely to the Y position of the character in the world. While searching around I found a link to my old article about formalising adventure game design - which I still think is an interesting concept and something I'd like to look at more. Then while searching a little more I stumbled on the website of xii games an indie game dev making an adventure game. During the designing process of Resonance, I was careful to avoid these kind of tacked-on puzzles. As much as possible, puzzles that the player comes upon should be defined by problems caused by the plot with solutions involving the plot and rewards that move the plot along. Obstacles encountered shouldn’t be arbitrary or unrealistic. Puzzles should feel natural, as if you could encounter them in real life, and should be overcome in manners consistent with real-world logic. If the solution is not readily apparent, it should be hinted at in the normal course of the game, and if possible, should be tied in with the story. The game looks interesting and I'll be keeping an eye on it.